Ouyang Xiu (歐陽修, 1007-1072) was a Chinese poet, calligrapher, historian and statesman of the Song Dynasty. His courtesy name was Yongshu (永叔); his pseudonyms were Zuiweng (醉翁, old drunkard) and Liuyi Jushi (六一居士, Resident of Six Ones). The “Six Ones” were: ten thousand books (in Chinese, “ten thousand” is “one wan”), one thousand pieces of bronze inscriptions, one pot of wine, one set of go (a Chinese board game), one string instrument, and one old drunkard. 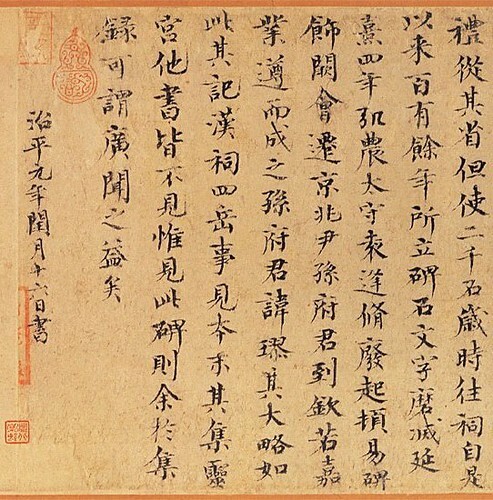 Ouyang Xiu reintroduced the simple “ancient style” in Chinese literature and sought to reform Chinese political life through principles of classical Confucianism. Ouyang’s personal influence and many-faceted activity had a lasting effect. As a statesman, he worked to regenerate political life through classical Confucian principles; he criticized fearlessly, and he recommended the promotion of able men who eventually led opposing parties. 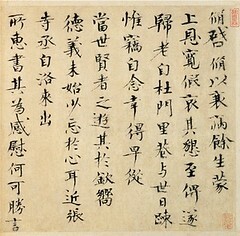 He was early captivated by writings of Han Yu (韓愈), whose opposition to Buddhism he shared, though in a more moderate form. 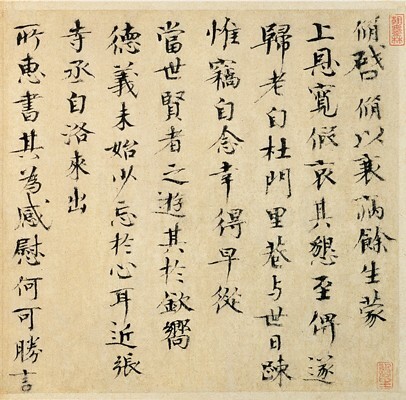 As the leader of the literary reform movement in the Northern Song dynasty, Ouyang established monumental prestige with his creative works and was esteemed as one of the “Eight Great Masters of Tang and Song.” He believed that those who grasp the Dao are able to create excellent works. Like Han Yu, Ouyang advocated a simpler, more direct prose to replace the mannered and excessively rhythmic style then popular, and his writings in the resultant guwen (古文) style established a model emulated thenceforth. 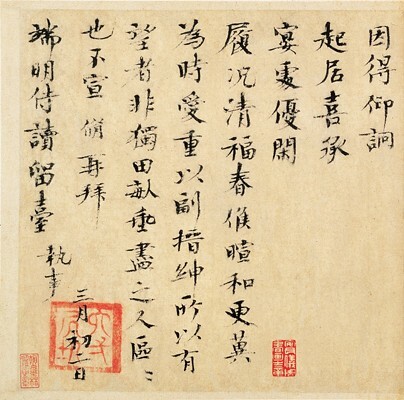 He emancipated the fu (賦) prose poems from strict conventions and left superb examples of these as well as of the newer ci (詞, lyrics set to popular tunes) and other literary forms. 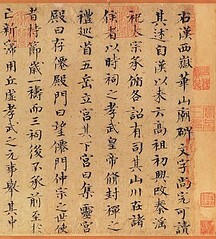 In his Xin Wudai Shi (新五代史, New History of the Five Dynasties) and Xin Tang Shu (新唐書, New History of the Tang Dynasty), Ouyang stretched the boundaries of the standard history and praised or censured men and institutions through terse but exact descriptions implying moral judgment, in supposed emulation of Confucius. As a scholar, Ouyang ignored later commentaries and instead sought a fresh and immediate understanding of early texts. 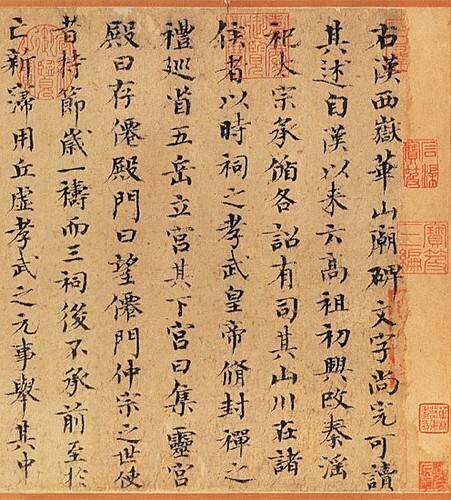 He contributed to archaeological study and compiled Jigu Lu (集古錄, The Collection of Antiques), which covers classical documents from the Zhou to the Tang Dynasties. 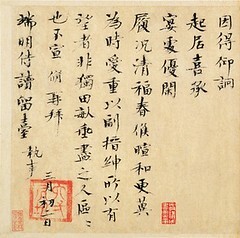 As a painter, he helped create the new wenrenhua (literati painting) style. His preserved writings include not only his histories but more than 150 chapters of poems, state papers, letters, and other smaller pieces. His library consisted of 10,000 books and a large collection of literary artifacts and archaeological records from ancient times. 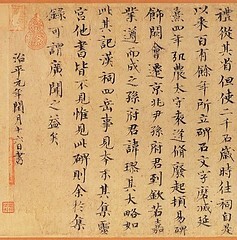 He was honored posthumously with the title Wenzhong (文忠, literary and loyal).